It is one thing to pull off a never before tried motorcycle rally, but to schedule the first day on a Friday the 13th might be considered by some superstitious types as insane. 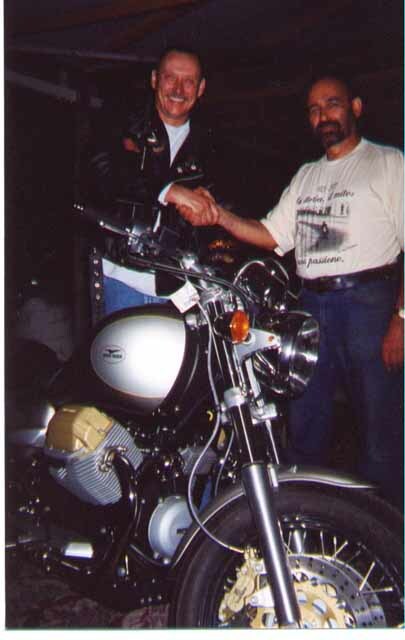 Those who know Ron Kurylo and Tom Canute (rookie organizers of the second, 1st Annual Michigan Moto Guzzi Rally) will never question their sanity again. Almost exclusively via email, fax, and phone, these two Guzzi enthusiasts organized the Michigan Rally without a flaw to be held on September 13-15. The facilities were superb, the weather was excellent, and the attendance was far more than expected. Friday the 13th? Not a problem. Cari, my Guzzi lovin' mate of three years, and I decided to visit the campground on Thursday night. We wanted to check our tent and we also just wanted an excuse for a nice evening's ride. So, we rode the 16 miles from our home to Cycle-Moore Cycles and Campground. We didn't expect to see anyone there, but I'll be darned, there were already five early arrivals, complete with beverage, campfire, and long tall tales. This was a clear sign that there would be many more good things to come. Now folks, you aren't gonna believe the rally facilities at Cycle-Moore Campground in Interlochen, Michigan. There are numerous campsites complete with fire rings, electricity, flat grassy surfaces, free firewood, swing arm (horse shoe pitching) pit, performance stage, cooking and kitchen facilities, and holiday type lighting in the trees, shelters, and fences. It looked like a small amusement park. The shower and bathroom facilities were clean, modern, and welcoming. Now, I saved the best for last. The gathering pavilion, open on all sides, had wall to wall carpet. That's right, a first rate outdoor facility with colorful carpeting - and it wasn't that indoor/outdoor carpet, it was carpet that was obviously removed from a casino and installed on the cement floor. Compliments to Steve and Shirley Moore of Cycle-Moore Cycles and Campground for developing such a unique and user friendly campground over the years. Cari and I arrived at the Guzzi Rally around 4:00 P.M. and as we rode through, there were the beginnings of a nice, compact event. A fine dinner of hot dogs and baked beans greeted the new arrivals. The license plates of the growing number of Guzzis revealed people had already arrived from Massachusetts, Ohio, and New York, as well as a smattering of riders from Indiana, Minnesota, Texas, Kentucky, Florida, and of course several of Michigan's own. Then, minute by minute, hour by hour, the Guzzis started pouring in - first in groups of two, then four and around 7:00 P.M., six riders arrived from the Grand Rapids area with a couple of Chicago Guzzi brethren thrown in for good measure. The campground was beginning to fill up. First count totaled roughly 65. We all looked at each other in amazement as we had already surpassed our estimate of attendees and it wasn't even 9:00 P.M. on the first day of the rally. Campfires began to flicker throughout the area, bikes were parked for the night, and the beverages began to flow. Then the tall tales of amazing rides, desperate mechanical failures on deserted roads, and beautiful vistas viewed at other great Guzzi rallies across the nation. The Michigan Rally was indeed going to be one for the books. The previous evening gave everyone in attendance an ample opportunity to greet old friends and to make new ones. This Guzzi crowd, as we have all grown to know, is welcoming of everyone and every bike on the planet. As soon as the sun was up, Ron Kurylo and his wife Pat (that woman is a saint!) 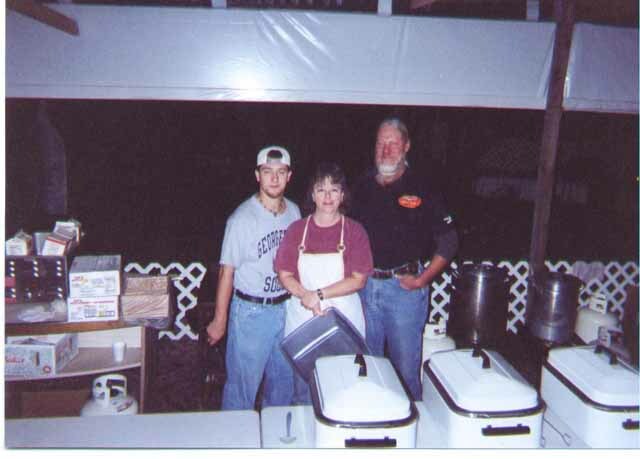 and their son Brian were up and cooking some of the best biscuits and gravy this side of the Mississippi River. Brian masterfully cooked up a load of scrambled eggs and sausages to accompany the biscuits and gravy. Tent flaps opened and those who could see, made their way to the coffeepot and grub. It was starting all over again. The parked parade of bikes showed clean restored Ambos and Eldos - one stunning fire engine red Jackal, an array of EVs, Calis, and Sports with an old Norton and BMW thrown in for good measure. All very nice bikes by any standard. The campground was filled with just about every kind of Guzzi made in the last 30 years. After breakfast, Tom Canute, rally organizer, took the lion's share of riders north up through the famed Leelanau County, complete with Lake Michigan shoreline and beaches, cherry orchards, and wineries. The roads were smooth and the sweepers and twisties were a real joy. The group gathered at the Happy Hour Tavern for lunch and more tall tales. Compliments to the management and staff at the Happy Hour for their good service and welcoming attention to our group. All returned to camp and ready for more good food. The Kurylo family had prepared spaghetti and meatballs. By now the total number of rally attendees had reach a whopping 115. You could see Ron and Pat begin to sweat as the spaghetti and meat sauce got lower and lower as the hungry crowd passed through the chow line. Would they make it? Would somebody not get fed? It was by the skin of their teeth, but everyone got fed something (whew). I guess it makes a difference when 26 people register and 115 show up. Early morning was greeted by another 20 gallons of coffee. A wide variety of cakes and cookies were graciously provided by Pal and Alice Szostak our MGNOC Michigan Reps. Having our bodies nourished, Bill Spurrier provided spiritual nourishment by ministering to a good size crowd for Sunday service. Thanks Bill for the blessings as many tackled the ride home. This was certainly a hodge podge of motorcycle enthusiasts ranging from Guzzi lifers to a Yamaha rider who had less than 400 miles on his bike. Soup to nuts as my father Keith would say. This rally had the good fortune of having two dealerships represented, both from Michigan. Grand Rapids Guzzi, represented by owners Jamie Muller, Phil Mowers, Bill Alfred and Ken Tarbell arrived with two shiny new Guzzi demo bikes. One was a pumpkin colored, 2002 Stone, and the other a sweet 2002 Special Sport. What a real bonus to have demo rides at your first rally. Grand Rapids Guzzi also was an official sponsor of the event and helped spring for the rally pins, as well as providing a leather jacket and chaps for the door prize drawing. Bravo to MGNOC Newsletter author Jamie Muller and his crew. On Saturday, the long awaited door prize drawing was held and there were so many door prizes that Ron and Tom went through the entire attendance once, then threw all the names back in the drum and started drawing a second time. Kudos to rally organizers Ron and Tom for really hitting the sponsor circuit. THANKS TO SPONSORS: Bill and Donna Spurrier, Chase Harper, Dennis Kirk, Frank Wedge/MGNOC, GT Motors, Grand Rapids Guzzi, Harper's Moto Guzzi, Illinois Moto Guzzi Riders, Jim Somers, K&N Air Filters, Kentucky Rally Organizers, Moto Guzzi Classics, Moto Guzzi Owners of Minnesota, Moto International, Paul and Alice Szostak, Precision Imprints, Rider Magazine, Riders Wearhouse/AeroStich, Roadgear, Inc., Sargent Cycle Products, Sliks Helmet Liners & Accessories, Stanley Overstreet and Whitehorse Press. In closing, Ron and Tom say there will be another rally. So, if you need a new route to ride, a new destination to seek out, and some new friends to add to your list, put the Michigan Rally on your 2003 riding calendar.